Schools shut; my neighbour’s son was walking around in the rain. He seemed happy for it. Mumbai likes the rain. But when it rains hard, it sits up and takes note. There is that memory of a July 26 from ten years ago, which haunts. Last month was unbearably hot. May 2015 was reported as the hottest May in recent times. Over 2200 people died of the heat in India. Now the gathered grey pleases and worries Mumbai in equal measure. There is an emergent trend in the rain to suddenly gift intense spells and prolonged downpours as compared to the steadier, stretched out pattern of before. Friday’s heavy rain began on Thursday night. Thursday night is also when Friday dawns these days of Internet with the next morning’s news already available to peruse. Among prominent news therein was: Pope Francis had spoken up for the environment. He wanted the world to take note of climate change and mend its ways. I would have viewed it as just another bit of news had he not faulted businesses and companies as well. That struck a chord. The thing is, you can’t tackle humanity’s problems with one foot in the market and one foot in situation craving change. Money seeks to guard against insecurity and in its effort to do so, is very conservative. It does not court potential loss. Its style of transition is to milk an existing cash cow, keep investing in the unsure new and when the new has become surer, wean off the old. This takes time. It’s probably why despite years since the world first reported the hole in the ozone layer, we merely drifted further and further down the road to global warming and climate change. 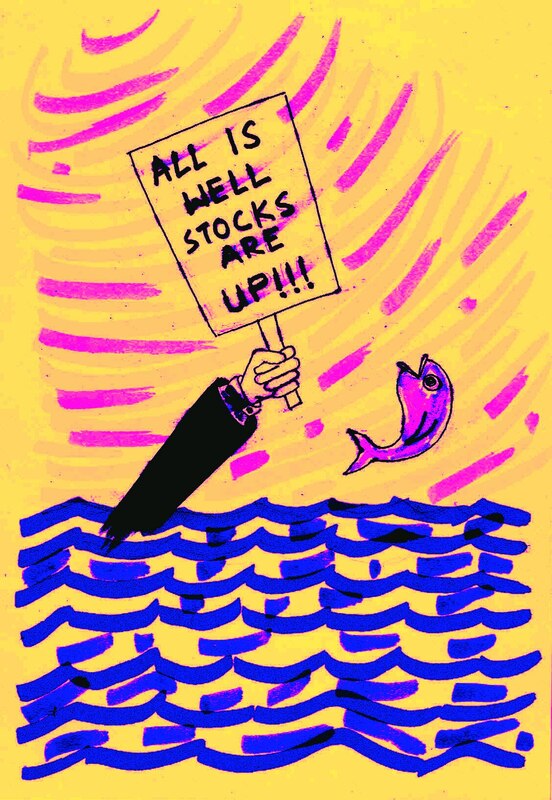 The market doesn’t yet perceive the fight against climate change as urgent. Businesses rarely take u-turns. To shift course they seek critical mass, maybe the Pope and some more; perhaps lot more. Leave alone business, this tendency has pervaded human existence for containable, responsive small formats are giving way to lumbering mega formats. Relevant change is actually becoming more and more difficult. Problem is – what we are beset with exceeds concerns of profitability. You wish to see some evolved intelligence in the market-animal. That’s asking for too much. Even the existing buzz around employment is: enjoy the money; don’t think about the work. Roughly a month short of ten years ago, on a day of rain and tide like this with however an intense spell of cloud burst in between, Mumbai was treated to how money behaves. On July 26, 2005, while the city flooded, the local stock exchange indices gained. Next day, thanks to many people staying back at brokerages, trading was again brisk. News of several dead in the rain had emerged. But on a low volume of trade, the indices gained again, the BSE Sensex breaching the 7600 mark for the first time. The market was just doing its job. It has no need to imagine differently. The market is the home of money, the cold glue in the human ant hill. For some time now, the market – the sum total of business and companies – has been this strange mental repressor. It gives us money to enjoy but delays relevant shifts which must happen in our time and instead, prolongs the old. The trend won’t change unless money shifts from the repressive spot it is currently parked in, to more meaningful spots. But how will money shift if all that money cares for is its own secure multiplication? It is evident in how any change must first satisfy questions around business model. Freelance writer was also asked recently by employed ex-colleague, “ do you have a business model?’’ It felt like a heartless but inevitable epitaph. I can’t dispute the truth. Can I? In the resultant favouring of those changes with profitable business models, we have been sold as fantastic innovation, stuff that certainly mints money. But did they create real difference? – I wonder. Did your life dramatically alter because you could drive a monster of a car on the road; have 1000 songs in a device in your pocket, post your look every two minutes on the Internet or litter the world with cyber trails of whatever you do? In fact, the experiential aggregate of engaging in these ` changes’ would possibly be to internalize the culture of excess and make oneself inert to the real changes required. Married to contemporary scale many of these sponsored changes have the quality of waves sweeping us off our feet. Assessed for relevance, this isn’t much different from the impractical idealism of freelance journalism. My ex-colleague is perhaps the more sustainable of two cases of irrelevance then? Maybe. I suspect, if you wish to partner the really relevant new you will have to take a pay cut for no money will court the relevant new if risk is not lowered. Right now nobody wants a pay cut. Nothing new happens. Or more accurately, what is `new’ is a lot of trends that money loves. That’s viable business model. For some reason, I ended Thursday listening to Neil Young sing `Old Man.’ Afterwards he spoke of the hole in the sky and the need for sustainable farming. Stuck in my office the night of July 26, 2005, I remember listening to Traffic’s ` Dear Mr Fantasy’. That night, many people in the city were at their office or someone else’s. Outside it rained. Late afternoon, Friday; it was still raining in Mumbai. The Internet had photos of flooded railway tracks, waterlogged roads, fallen trees and marooned vehicles. In chat rooms, Mumbai’s municipal corporation – veteran of weathering criticism every monsoon – was under attack. The state chief minister visited the corporation. Later he tweeted asking everyone to be safe. On Friday, Mumbai reportedly received ten day’s worth of its regular monsoon in one day. Two people died; search was on for a missing third. The stock market gained. It closed Friday at 27,316. The 7600 from ten years ago seemed unrecognizable. Flooded city though was most recognizable.